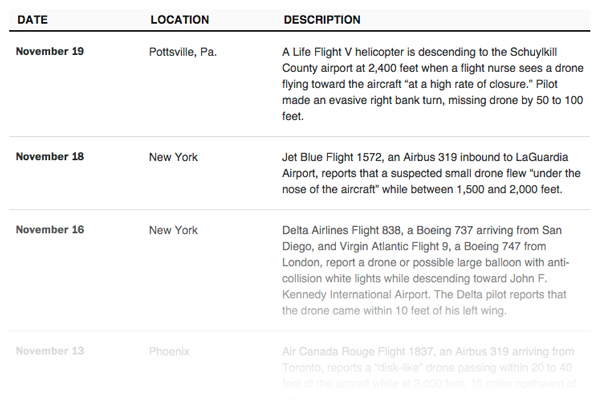 “More Drones are Spotted Flying Near Aircraft,” read the title of a recent Wall Street Journal article. Meanwhile, other reporters have characterized an apparent increase in sightings of unmanned aerial vehicles (“UAVs”) near flying commercial airplanes and airports as a “surge.” Indeed, according to an incident report of the Federal Aviation Administration (“FAA”), pilots of passenger airlines and other aircraft have reported 25 near-collisions with small drones across the United States since June 1, 2014. In truth (and the referenced Wall Street Journal article makes this point), the difference between about five drone sightings a month at the beginning of this year and the current approximately 31 reports of drone sightings may be the result of better reporting and and record-keeping by pilots and controllers rather than an spike in careless or reckless UAV operations. How is that? Well, consider that a robust set of regulations already exist in the United States and abroad to mitigate against the dangers of other small flying objects — yep: Birds. The animal kind. Rules or no rules, as the number of small, low-cost remotely piloted aircraft boom, the devices will undoubtedly come into conflict sooner or later with an air transport aircraft near an airport. The probability for harm when that happens is potentially no different from the risks already occurring from collisions with birds, and those are threats airlines fly with on a daily basis around the world. To mitigate the bird threat, the FAA and European certification standards require an airframe to handle the impact of a 4-lb. bird at high speeds and a windscreen to handle the same size bird without splintering the inner ply. The FAA also requires an aircraft’s empennage to survive a collision with an 8-lb. bird at high speed. Both the FAA and Europe have stringent requirements for engines, which include ingesting single birds weighing 4-8 lb. and multiple birds weighing 1.9-2.5 lb., all while continuing to produce thrust at some level. Against this backdrop, the FAA is expected to release guidance to would-be commercial UAV operators under Section 333 of the Modernization Act of 2012 in the coming weeks (if not the coming week at the time of this post) and it can do so with current regulations designed to mitigate against the threat posed by unmanned (albeit living) aerial assets. 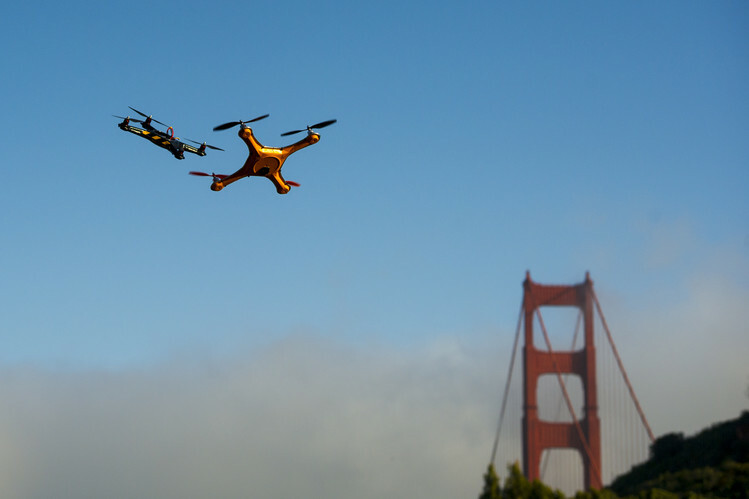 The gulls that rival the Vision 2+ quadcopter in size caused $53 million in damage over the 23 years, a significant amount that draws virtually no headlines. A fair statement to keep in mind – at least when it comes to the interaction of commercial (as opposed to general) aviation and the emerging sUAV market space. Posted in UAV on December 2, 2014 by Timothy M. Ravich.